Balatonfüred is a small town with a population of 13.500. It is an ancient settlement which was already inhabited during the reign of the Roman Empire. Ancient residential districts, old buildings, churches, intimate vineyards, parks and old trees send their message to the people of our present time. 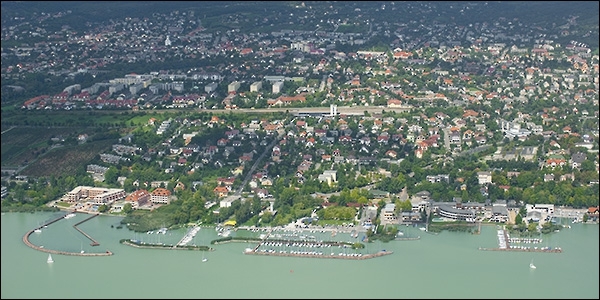 The name of the town was first mentioned in the land register of the Benedictine Abbey of Tihany in 1211. There were several settlements in the Middle Ages in the area of the present-day Balatonfüred. One of them was Füred which still exists but it has had a major role only since the reform era. To the west you can find Papsoka – it has been called Siske since the 14th century – which was soon united with Füred. North of Füred the Kéki valley has preserved the name of the former village of Kék (Blue). This settlement did not survive to see the Ottoman occupation of Hungary. Arács, which constitutes the north-eastern part of Füred was an independent village until 1954. The settlement of Magyaré, which is situated to the south-east of Arács, was incorporated with Arács by the end of the Middle Ages. The historical traditions of Füred determine the lifestyle and attitude of its inhabitants and guests. The tourism of the town has started to develop for centuries, and it had been declared a spa in the first half of the 18th century, then it was immediately put in the limelight. Balatonfüred has been the first spa of Hungary since 1971 and it also became the ‘International Town of Grapes and Wine’. Its fame mainly originates from its mediterranean-like climate and mineral springs. Today the water of the mineral springs is used by the State Hospital for Heart Diseases for therapeutic purposes. You can taste the famous sour water of Balatonfüred at the Kossuth spring, the Berzsenyi spring, the Szekér Ernő spring and the Schneider spring. Many people suffering from heart diseases have recovered their health in the State Hospital for Heart Diseases. So has the Nobel-prize winner Hindu poet Rabindranath Tagore after whom the promenade was named on the shore of the lake. The town is incredibly rich in historical sights. Most of them were rebuilt and renovated. Some of them play a different role as compared to their original function, but they are definitely part of the cultural life of Balatonfüred. There are numerous famous villas and mansions in the town, whose owners contributed a lot to the image of Balatonfüred with their presence and brought the town international fame. Among the architectural masterpieces of the 18th centuries you can find the Nagyvendéglő (Big Inn) which is called Hotel Anna Grand today, the State Hospital for Heart Diseases, the pump house built on the Kossuth Lajos spring, the larger house of Pálóczi Horváth Ádám and the mansion of Széchenyi Ferenc, which all determine the atmosphere of the town even today. 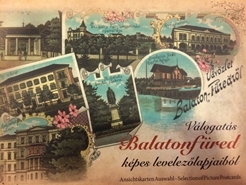 Balatonfüred started to develop in the 1800s, in the Reform era. It became a popular meeting place for progressive politicians and artists; its historical and cultural significance was at its peak at that time. The town has numerous monuments, historical buildings and traditions: in 1825 the first Anna-ball was organized in the Horváth house. In 1831, from donations of the people from this region and with the help of the Abbey, Kisfaludy Sándor opened the first Transdanubian stone theatre, the home of the Hungarian language in a period when German was the official language in Hungary. The atmosphere of the historical part of the town is enriched by the Blaha Lujza villa which was built in 1816 in classicistic-style where the famous Hungarian prima donna of the turn of the century, the so-called ‘nightingale of the nation’ spent her summers for 23 years. The building is a hotel and a restaurant today. The famous spa-doctor and owner of the Huray-houses, Huray István also had a summer residence here. However, the Dőry-villa was said to be the most beautiful of the summer residences built at this time. It is worth visiting (its present name is Hotel Astoria). A round building with a dome and a portico with Ionic columns strikes the eye at the corner of the Jókai and Blaha Lujza street. The Round Church, which was designed by Fruhman Antal at the example of the Roman Pantheon, was built in 1850. The Jókai villa was built in 1870 in early-eclectic style. A permanent exhibition in the building shows the furniture of the villa and the life of the greatest Hungarian writer. The Reformed Church, the Catholic Church and the newly built Lutheran Church as the ornaments of the upper part of the town rise to the air guarding the peace of the town. The present-day old town – the old village and Balatonarács which was annexed to it in 1954 – has a significant number of valuable monuments. On both sides of the Kossuth Lajos street, which leads to the old village, you can find single-storey and multi-storey buildings close to one another. In the old village – or as it is called nowadays the Old Town – the following buildings marked with a plaque still preserve the traditional styles. The Siske street is a part of the Old Town where the end of the street leads into the forest. There begins a promenade, which is a pleasant place for making excursions and going for walks. One of the most well-known buildings of Füred is the Gombás-mansion. People who liked beauty and had a good taste built houses like this around Lake Balaton. In Balatonfüred, which was one of the most popular meeting places of the nobles of Zala county, there are plenty of these late Baroque houses not far from each other giving a very vivid picture of the region.